NASA’s Opportunity rover still hasn’t made contact after a weeks-long Martian dust storm forced it to go into hibernation, but at least the skies are now clear enough to spot the solar-powered robot from orbit. And mission managers say they’re a long way from giving up on Opportunity, which began its work on the surface of Mars almost 15 years ago. 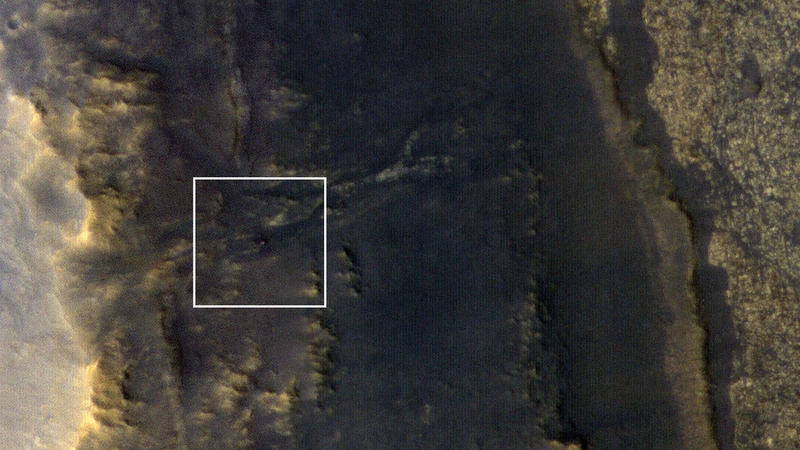 Oppy shows up as a blip on the slopes of Perseverance Valley in a color image captured Sept. 20 by the Mars Reconnaissance Orbiter’s High Resolution Imaging Science Experiment, or HiRISE, from a height of 166 miles. The orbiter’s clear view raises hopes that winds will sweep dust off Opportunity’s solar panels, as has happened several times before, and allow the rover to build up enough power to resume transmissions. This entry was posted in GeekWire and tagged Mars, NASA, Opportunity rover, Space. Bookmark the permalink.